"Chocobo Racing, known in Japan as Chocobo Racing: Genkai e no Rōdo (チョコボレーシング 〜幻界へのロード〜, lit. 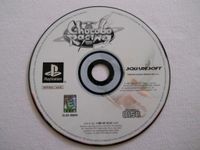 "Chocobo Racing: Road to the Spirit World") is a racing game for the PlayStation game console. The game was developed by Square Co., creators of the Final Fantasy series of video games. The game was first released in Japan in March 1999. North American and European releases followed that year. The game was later released in Japan alongside Chocobo Stallion and Dice de Chocobo as part of the Chocobo Collection. On December 20, 2001, the game was re-released individually as part of the PSone Books series. The game received generally average reviews, citing its low quality in several aspects of gameplay." Source: Wikipedia, "Chocobo_Racing," available under the CC-BY-SA License.